LONDON, UK – The British bike trade had a rollercoaster 2008. There were highs, there were lows. In the middle of the year there were screams of joy as British Olympic cyclists raised the sport’s media profile like never before, but by the end of the year there were screams of shock as the recession kicked in. The bike trade is probably more resilient than most at surviving a downturn. This is because sales in winter always take a turn for the worst. But some British bike shops reported alarmingly low footfall in December. Hibernation couldn’t come too soon. Yet 2008 had promised to be a bumper year. Escalating fuel prices and growing concerns about climate change created a perfect storm, blowing people on to bikes for at least half of the year. But the US sub-prime mortgage fiasco which escalated into a global financial meltdown made people forget about saving the planet, and they stopped driving, too, but, by year end, they weren’t getting on bikes, either. Some of this was due to the cold winter. When it’s perishing, Brits mothball their bikes. Ever optimistic, the British bike trade is banking on the commuter market being a saviour and for the resurrection to happen at Easter. Good Easter weather is usually a sign that good sales will result for the summer. 2008’s summer weather was just as freaky as that of 2007 but, bizarrely, despite the rain, cycle usage rose, especially in the big cities. Britain, it appeared, had woken up to the potential of the bike as a transport device. Much of this was down to rising petrol prices. When, at the end of 2008, petrol prices dropped right back, the bike trade suffered a drop off in sales. However, this was also when the credit crunch started to bite, when discretionary expenditure of all sorts was being plugged. Thankfully, the year ended on two bright notes. On January 1st, The Independent newspaper splashed bikes on its front cover, saying 2009 would be the Year of the Bike. At the end of December, triple gold medal cyclist Chris Hoy was voted the BBC Sports Personality of the Year – a big deal in the sports mad UK – and just days later the Queen made him a knight of the realm, turning the Edinburgh sprinter into one of the most recognised celebs in Britain. With fame has come lucrative endorsement deals, and this benefits cycling as a whole. When Sir Chris is used in TV adverts – he’s now never off the screen – he’s always shown on his bike. 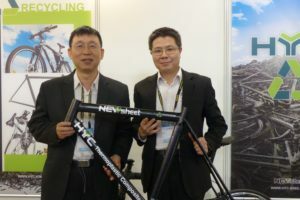 There was no bike sales spike in September after the Olympic games – the wished for Beijing Bounce – but cycling’s regular appearances on mainstream TV and in the mass market press is sure to have a positive effect throughout 2009. Ad hoc stats from the Association of Cycle Traders (ACT) show that independent bicycle dealers had a good year overall, but a very challenging fourth quarter. In November, sales nosedived. ACT reported that during this month 54% of its members reported a drop in turnover. In October 2008 63% struggled with decreasing revenues. 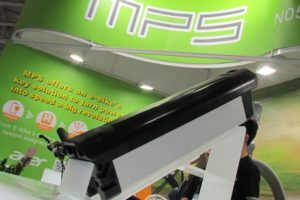 September was different and showed that 65% of the dealers were able to increase their turnover while also in August, July and May the number of dealers that reported revenue growth outnumbers the ones that said to experience a declining turnover. The independent chains continued to take market share from single store IBDs but true independent chains are now rare. Cycle Surgery, for instance, expanded in 2008 but is no longer independently owned. It’s part of the Snow+Rock group. Formerly London only, the Cycle Surgery store brand was carried over to stores in Romford, Wirral, Birmingham, Didsbury, Port Solent, Bristol and Chertsey. It now has 15 stores nationwide. The biggest of the powerhouse IBD chains – Evans Cycles – spent much of 2007 and early 2008 fending off claims it was about to be sold. It was seeking a bigger shareholder, said Evans, with cash to fund expansion. In April, a deal was finally inked. Active Private Equity acquired a majority stake in the business via a combination of acquisition and growth capital. In the past five years Evans Cycles has added 20 stores and expanded outside of its South East England base. It now has 31 outlets. Cycling gets a lot less money from central Government than it would like, but a lot more than it used to get. In January 2008, the Department for Transport pumped in a record GBP 140 million (€ 156.5mn) investment. Cycling England had asked for GBP 250 million (€ 279.4mn). Cycling England’s previous budget was GBP 10 million (€ 11.2mn) per annum. The GBP 140 million (€ 156.5mn) is split over three years. Bristol may be Cycling England’s official Cycling Demonstration City but it’s London that is doing most to promote the use of bikes. 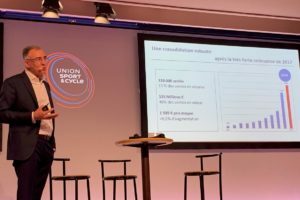 At a cycling conference in October, speaker Peter Lensink of Ned Railways said cycling in London was at a tipping point. Before he was ousted by cyclist Boris Johnson, the then Mayor of London Ken Livingstone announced a GBP 500 million (€ 559.2mn) 10-year plan to transform cycling in London. There’s to be a Vélib-style bike hire scheme with 6,000 bikes available every 300 metres. There will also be radial ‘Cycling Corridors’ – bicycle superhighways – for commuters to provide high-profile, easy to follow cycling streams into central London. 2008 was the breakthrough year for Raleigh UK’s three year old retail franchise package, Cyclelife. This has the potential to rebuild the Raleigh brand via a growing network of dealers. In February, Raleigh became a member of the British Franchise Association. By April Raleigh had signed up its 100th member. Cyclelife dealers get preferential trading terms from Raleigh, stock finance, store development consultancy and finance, and operational and finance support for marketing activity. Raleigh’s aim is to develop a network of 200+ Cyclelife dealers. Sales of satnavs and bikes enabled Halfords to have a relatively good 2008. Relative, that is, to much of the rest of retail. The High Street had a rough year on the whole and Halfords managed to grow – albeit only slightly – in tough operating conditions. The year started with the high-profile sponsorship of Team Halfords Bikehut, built around Olympic hopeful Nicole Cooke. She later won gold in the women’s road race but by year end she had to found her own team when Team Halfords Bikehut switched its emphasis to male cyclists only. In March Halfords reported 7% year on year growth. By the middle of the year, sales were still increasing but only by a paltry 1.7%, year on year. By September the growth had slowed to 1.6% year on year. Revenue for the 26 weeks to 26 September was GBP 407.1 million (€ 455.3mn) up from GBP 400.7 million (€ 448.2mn) in 2007. 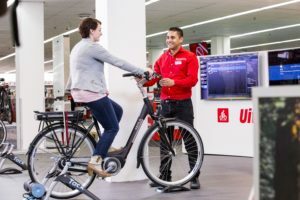 As well as standalone Bikehut stores, Halfords has recently rolled out a test store format for standalone stores in York and Norwich. Designed to look and feel more like independent bike shops than corporate stores, the Cycle Republic test format has ‘researched positively with customers’. Halfords believe that there is the potential for at least 50 stand-alone cycle stores across the UK. The summer of 2008 was wet but the escalating cost of fuel – a major media story – meant cycle usage grew, especially in big cities and most definitely especially in London. The mainstream media banged on and on about the ‘bike boom’ caused by higher petrol prices. Many media pieces focussed on new converts to cycling. And, with the zeal common among converts, they recounted how they may have started cycling because of the spiralling price of fuel but they discovered how much faster cycling is in towns and how much weight they’ve lost and – the knock-out punch – how much fun it was. All good stuff for the image of cycling. Bike sales didn’t seem to rise, although sales of get-your-bike-back-on-the-road accessories went through the roof. Halfords commissioned a survey which showed that 42% of Brits might switch from cars to bikes. 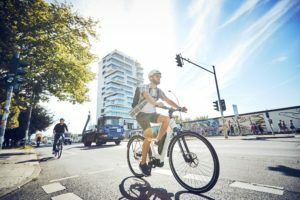 The survey, to promote the Halfords Cycle2Work scheme, found that saving money on fuel was deemed to be the greatest benefit for switching to two wheels, with 89% of respondents citing this would be the main reason to change. 69% said environmental concerns could make them switch.